If you love wearing CK, Gucci, Levi's, BVLGARI, and your purse is not enough heavy to buy these expensive brands, your shopping destination should be Zainab Market. Zainab Market is the place where you can shop all big name brands for as low as five dollars are even less. Clothes, home to jeans, shirts, trousers, caps, belts, sunglasses are available here for a few dollars. In just under a few dollars you can turn yourself from rags to rich. A teen of Karachi surprised when find a Zara top for 500 rupees or 5 US dollars. The same she pought from London for a 'relatively huge' amount. 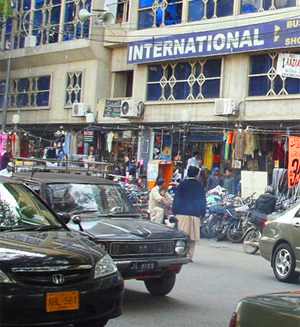 Zainab Market has been a popular shopping spot for foreign tourists specially from west for decades. Even now when terrorism restricted foreigners to come Pakistan many are seen round the area for quality denim and trendy products by western brands at Pakistani prices. How this is possible? A stockist tells that items come from factories in Karachi. It is all export quality, sometimes it is excess or rejected stock. Whatever is fact but Zainab Market is the best attraction for those who love world famous fashion brands at very low cost. That is why clients from all income and age groups come to Zainab Market and despite the lack of space and the miniscule changing room they prefer to buy from here. 740-C, behind Tariq Centre, Tariq Road, Karachi. 9-C,34th Commercial Street,Tauheed Comm. Area,Phase-V,D.H.A. Flat-4, #42-C, 25th Comm. St.Tauheed Comm.,Phase-V,D.H.A. Shop No.4,Mall Square,Zamzama Blvd.Phase V,D.H.A. Park Towers is the most popular of all shopping malls in Karachi. Located at Clifton, it has more than 1500 shops. The mall is pretty lavishing and also has mini restaurants and car showrooms. There is a giant McDonald branch and a KFC branch as well inside the mall so you don’t need to worry about dinning after you shop. Located at Tariq Road, the busiest shopping street of the city, Dolmen mall offers more than 500 shops of branded and unbranded stuff. Some of the major brand outlets like Levi’s, Stonage and Dockers can be found here. Compared to Park Towers, Dolmen Mall attracts more shoppers because of its central location in the country. It also has two restaurants in it and a number of book stores such as Liberty and Paramount books. For serious shoppers, Dolmen Mall is the best mall to be at. Millennium Mall is not just for shoppers but also for people who are looking for some fun activities to engage in. it has a huge bowling arena, a kid’s fun land and a number of other restaurants including KFC. 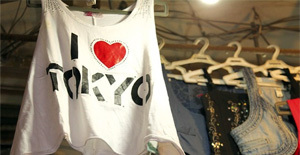 It is best for someone looking forward to shopping along with family fun. One of the Karachis' finest shopping places is The Forum situated in Clifton. A wide variety of shops selling jewellery, handicrafts, clothing, shoes, cosmetics and many more is here. This is a centrally air conditioned mall that also offers the good dining options. Park Tower is Karachi famous shopping mall with a wide variety of shops which includes clothing, jewellery, handicrafts, export quality bed linen and books. It also has a food court, a children's entertainment area and a supermarket division. Saima Pari mall situated at North Nazimabad is one of the best shopping places innorthern part of the city with an extensive long range. This fine shopping mall is situated at Hydari Market and has almost everything you need for your home and for yourself. A Grand Fashion Show was held at the newly renovated Grand Marquee of the Pearl Continental, Rawalpindi. The event featured the latest in couture designers. In vogue talented designers models and brand ambassadors were seen showcasing the latest couture designs. The Grand inauguration of The Fashion Show was inaugurated by H.E Mrs Margaret Adamson, Australian High Commissioner to Pakistan, the Honourable Ms Diana Bao, wife of the ambassador of China to Pakistan, Haseeb A. Gardezi VP Operations / Hospitality Division Hashoo Group, Ahmed Iqbal Saeed General Manager Pearl Continental, Rawalpindi along with several other ambassadors, notables of the Twin Cities and the famous fifty models, including the grand show's brand ambassadors.